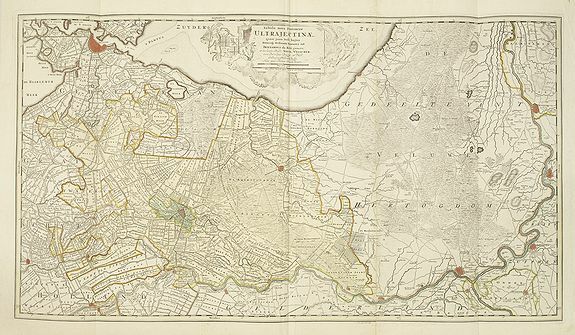 SCHENK - Tabula Nova Provinciae Ultrajectinae. . .
SCHENK, P. - Tabula Nova Provinciae Ultrajectinae. . .
Tabula Nova Provinciae Ultrajectinae. . . - SCHENK, P.
Title : Tabula Nova Provinciae Ultrajectinae. . .. Size : 18.0 x 32.7 inches. / 45.8 x 83.0 cm. Description :Prepared by Nicolas Visscher, now published by Petrus Schenk. Shows the land development in Gelderland, Holland, near the Zuyder Zee and it shows Arnhem, Doesburg, Zutphen, Utrecht, Gouda and Amsterdam. Condition : Condition is very good. Two sheet joined together. With uncoloured title cartouche as issued.